SUNRISE, Fla. - Aaron Ekblad came back, and the Florida Panthers made an emphatic return to their winning ways. Against the reigning Stanley Cup champions, no less. 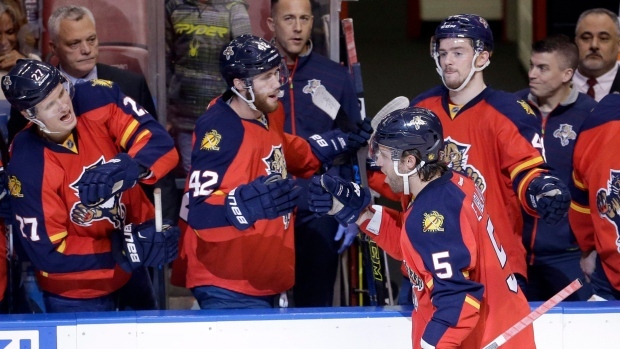 Roberto Luongo stopped 27 shots for his fourth shutout of the season, Ekblad scored in his first game back after recovering from a concussion and the Panthers easily handled the Chicago Blackhawks 4-0 on Friday night to snap a four-game slide. "You talk about playing the Stanley Cup champs and we haven't played our best games lately," Panthers coach Gerard Gallant said. "I thought tonight we came out and played a sound game, good defensively, really skated, really moved the puck. We have to play our best game and that brought the best out of us tonight, playing that team." Florida had lost its last eight meetings with Chicago, last beating the Blackhawks on March 8, 2011. Chicago outscored Florida 25-11 in those games. "We didn't start well, let a couple goals go in and we were down 4-0 before you know it," said Blackhawks coach Joel Quenneville, whose team was playing its third road game in four nights. "There was no push and there was not a lot of energy tonight. It was one of those games where they started well and they were the better team." Reilly Smith, Quinton Howden and former Chicago defenceman Brian Campbell also scored for Florida, which took a 3-0 lead after one period and started a big weekend in a big way. The Panthers play rival Tampa Bay — the reigning Eastern Conference champions — at home on Saturday. "Put this one behind us and obviously play a very good team tomorrow," Ekblad said. Scott Darling stopped 28 shots for Chicago, which lost on consecutive nights in the state of Florida yet remains comfortably atop the Western Conference standings. The Blackhawks lost in Tampa on Thursday, after winning 12 straight to match the Panthers for the longest winning streak in the league this season. "We ran into two pretty hungry teams this week, teams that play with a lot of speed," Blackhawks centre Jonathan Toews said. "For the second night in a row we didn't match that speed and that pace, so I think we're pretty deserving of that result." And while Florida's winning streak is over, Ekblad's isn't. The Panthers have now won 13 straight games with him in the lineup. Florida was winless in its previous four games while the second-year All-Star defenceman recovered from a concussion suffered when he got levelled by Matt Hendricks in Edmonton on Jan. 10. Hendricks was suspended three games for the play, and Ekblad missed nearly two weeks. By the time Ekblad got into the scoring column, the Panthers had this one well in hand. Florida struck for three in the first period, its most since getting four in the first 20 minutes against Philadelphia to open the season on Oct. 10. Smith and Campbell got the first two, and Howden sneaked the third past Darling with 2.1 seconds left in the period. His was unassisted, and so was Ekblad's at 2:51 of the second — a blast from the right circle after a Chicago turnover. Luongo did the rest, getting his 72nd career shutout. "In the last couple weeks, probably our most complete game for sure," Luongo said. "We had a good start and the key was once we took the lead we didn't stop and try to sit on the lead. We kept going." Chicago pulled Darling with 8:23 left in the third, but he couldn't stay off the ice for long — a faceoff sent him back to the ice after only 3 seconds of an empty net, and then a holding call against centre Artemi Panarin with 7:52 remaining brought him back again to face a Florida power play. Quenneville said it was a why-not move. "You never know," Quenneville said. "You get one, all of a sudden you get excited. You never know." NOTES: With Ekblad and Campbell, Florida had two defencemen score in the same game for the first time since last Feb. 10. ... Chicago's four-goal deficit matched a season-worst. ... Quenneville's final game as a player was a loss in the 1992 Calder Cup finals to the Adirondack Red Wings, a former American Hockey League franchise where Gallant once played. ... Florida is 27-12-4 with Ekblad in the lineup this season, and went 0-3-1 without him.